EXCLUSIVE! 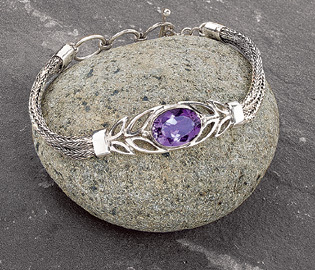 Strength and serenity are invoked by this bracelet. Double antiqued-silver cables support a bright faceted amethyst - a stone of calm and centering - held between stylized lotus blossoms. Toggle clasp adjusts length 7-8". Ordered this bracelet as a special anniversary present, and it couldn't have been more stunningly made. Very well received by it's intended recipient.